First of all, to understand the events in Damas, Dramas, and Ana Ruiz, you need to know what the word quinceañera means. It's a celebration or coming-of-age party held on a girl's fifteenth birthday that typically begins with a religious ceremony. And it is apparently a good way for mothers and daughters to bond. At least, that is what Ana Ruiz hopes will happen as she tries to plan her daughter Carmen's quinceañera. Ever since Ana separated from her husband, Esteban, she's not been able to connect with Carmen. Rather, Carmen blames Ana completely for the separation and refuses to hold any sort of meaningful conversation with her mother. Ana's son, Diego and her niece, Bianca try to help smooth things over between mother and daughter, but despite the quinceañera planning, their relationship remains strained. Ana wants to tell her daughter the truth about Esteban, but she doesn't want to break daddy's girl's heart. While Ana struggles to regain her daughter's love, she also struggles to regain confidence in herself. She has always been the strong one. She was the first girl in her family to go to college, and she managed to raise two kids at the same time. Yet, her separation from Esteban completely shattered her life. She doesn't know if she should try to reconcile or move on. To complicate matters further, a handsome and suave artist named Carlos Montalvo enters her work life. Over the course of planning the quinceañera, both Carmen and Ana grow up in their own separate ways. 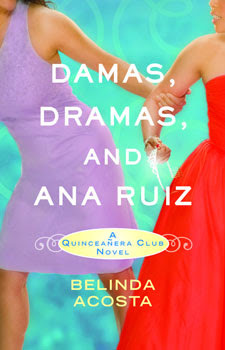 When I picked up my copy of the book Damas, Dramas, and Ana Ruiz, I was caught off guard. "Como se dice?" -- Umm, let me ask my translator, i.e. computer. Most of the book is written in English with a few Spanish terms effortlessly thrown in every so often to spice things up. While you can understand the story perfectly fine without knowing a bit of Spanish, I found it helpful to refer to my translator every once and awhile. That said, I'm glad I stepped outside my normal reading sphere because I learned about another culture and their traditions. Traditions like quinceañeras. Using subtle humor and an almost narrative writing style at times, Acosta manages to successfully portray a strained parent/child relationship in her book, just as the colorful cover suggests. (Though I don't think Carmen's quinceañera dress was red?) There are a lot of tense situations and many situations where it is evident that the characters deeply love one another. This would make an appropriate YA cross-over book, especially for those interested in bilingual reads. Acosta's depictions of strained parent/child relationships are realistic, as are her portrayals of the strong emotions and resulting family stress that occurs when parents separate. At times I got frustrated at Ana because she refused to level with her daughter and discuss facts. However, as a parent I can also understand how she would wish to shield her child from all things ugly. Acosta succeeds in writing an appealing and touching book that explores the relationship between a mother and a teenage daughter. Win a copy! This review is part of Hachette Early Birds Blog Tours, and Hachette Book Group has kindly offered to giveaway (3) copies of Damas, Dramas, and Ana Ruiz to 3 Brimful Curiosities readers. 3 COPIES! To enter, leave any comment relevant to this post. Thanks! Just out of curiosity, have you ever attended a quinceañera? • Contest ends on Monday, August 31st, 2009 at 11:59 PM CST. This book actually sounds pretty good. I never had a Quinceañera because I decided it was best to avoid the drama, and go on a cruise with friends instead! hahha! oh oh oh!! pls enter me! I want to read this book! also to answer the question; yes! I have attended a Quinceañera! my own! :) I'm half Spanish and it was one of the most memorable birthdays I ever had. I would love to read this one; I love reading about other cultures! I have never attended a Quinceanera but they sure sound like fun! My own culture is far more subdued. Formal dinners and whatnot. I've heard good things about this book and would love to read it. I have never been to a quinceañera. Never attended a quinceañera - it sounds intriguing! And I'd love to read this book. I'm a subscriber. This sounds like such an interesting book. I've already learned what a quinceanera is, although, I didn't have one on my 15th birthday. Thanks for this giveaway and please count me in. I have been to a quinceanera before. It was fun and the dress was so pretty. I love the dancing they did in the pairs. It was like being at a wedding. My friends ask me to go. Thanks for stopping by today. I hope you get all you need done in your home. I love to read and would love this book. This book sounds interesting. I've never been to a quinceanera, so it would be interesting to read. Have never attended a quinceanera... but saw a Disney Channel Wizards of Waverly place episode about one just the other day! This book sounds very interesting. I've never attended a quinceanera, but I would love to read more about it! I love some girl fiction action! The more reviews I see of this book, the more I want to read it. The deeply steeped heritage in doing a quinceañera seems especially interesting. I have never attended one, but my brother went to a co-worker's daughter's and said it was fantastic. It looks like Belinda Acosta has written a good book. I would love to be entered in your draw. Thanks. I have never attended one but it sounds interesting! I have never attended one-my neighbour is Hispanic and for her daughter's birthday party there is always a pinata. I have never gone to one, but my cousin went to one a few months back and said it was the best party she'd ever been too! I'd never even heard of, let alone attended a quinceañera until I read your review of this book. It sounds like a wonderful celebration. I know about quinceaneras because I taught ESL for a number of years and many of my students were Hispanic. I never had a quinceanera; I had a Sweet Sixteen, but I attended many quinceaneras. I never attended any quinceañeras but would love to read this book. I never attended a quinceaneras. This sounds like a fun and interesting book. Please enter me. Thanks! With my own daughter getting older, this book sounds very interesting to me! And I had never heard of a quinceañera before...sounds ike fun! oops I messed up on my earlier entry and meant to say I follow and tweeted. Sounds like a fun book to read...count me in. thanks. I have never attended a quinceañera - I never heard of it until this book started making the blog rounds. It sounds like a wonderful tradition & I'd like to know more about it. I am a follower (and a subscriber). please enter me into this giveaway. I've been to two quinceaneras and i really enjoyed them.